1. Lose 5 lbs. Mami's workin with some new curves these days and it just can't go on. Simple as that. 2. Be more positive. This is an ongoing thing for me. I'm hoping to not be such a Negative Nancy all the time. It's not becoming of a lady and manfriend hates it when I get on the train to Crabbytown. 3. I've given up eating Chocolate candies for lent. 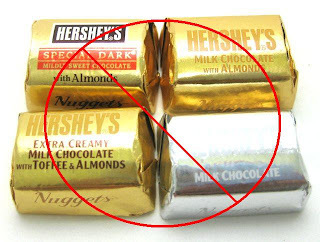 I've never really participated in len t, but my office keeps a drawer stocked with Hersey's chocolate nuggets. It's a weakness. It's sort of a getting skinny thing, but more of a "lets see if I'm stronger than the nuggets" thing. My mouth waters every time I go near the drawer. I'm nowhere close to dominating the nuggets. 4. Make a point to have at least one phone call with a faraway friend each week. I'm the worst at keeping in touch. Soon I won't have any friends. 5. Write 20 Poodleism posts. And 20 good ones at that. Ok, that's all for now...I need the 16 of you who have officially become friends of Poodleism to be my accountability partners! Can't wait to emerge from March skinnier and stronger than nuggets! Sidenote: How about the March resolution for all of you to become Friends of Poodleism and make more comments? Mad props to the two regular commenters. I'm trying to brainstorm some sort of thank you prize. Interested in nuggets? Sometimes I get a little down on the blog because I think nobody reads it. Maybe they don't, but the comments are the only way for me to know! I don't think you're negative. A bit sassy, but not crabby. Come over someday and I'll introduce you to crabby. He's just lucky I think he's cute. I'm joining you for the 5 pound weight loss by EOM (End of Month)!